We now have more details, and on-water images, of the new Pershing 82, due to be unveiled at the Cannes Boat Show later this month. 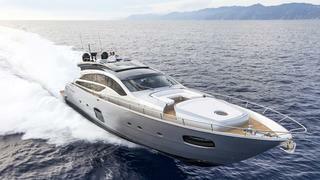 The Pershing 82 is a 'contemporary reinterpretation' of the old Pershing 80. At 23.99m LOA, and with a 5.50m beam, the 82 is driven by two MTU 16V2000 M93s putting out 2435hp and running on ZF surface-drives, giving it a top speed of more than 45 knots, and a range of 300 nautical miles. The surface-drives are run by AUTOTRIM, a system that automatically optimises the performance and fuel consumption of the boat at any speed and with any load, something that is notoriously tricky with surface-drives. The elongated superstructure and the new sun-deck, with an optional retractable helm station, is a distinctive feature in the new Pershing. The sun-deck can be reached via the innovative electro-hydraulic steel staircase which drops automatically into the cockpit and automatically disappears upwards when closed. The internal layout of the first Pershing 82’ has four guest cabins: the master suite amidships, a VIP cabin forward and two twin cabins. In addition, there are two crew cabins, a laundry room and a bathroom. Italian furniture designers Poltrona Frau designed the sofas in the living room, the pilot house and many other leather details, while Antonio Lupi designed the basins and Cassina designed the lamps. Also at the Cannes Boat Show there will be a customised version (called the New Edition) of the much-loved Pershing 108, with new details that distinguish it from the previous model. The internal layout consists of four cabins (a full beam master suite amidships, a large VIP cabin forward and two guest cabins (one twin and one that can be used as two singles or a king-size) and three crew cabins. The windows of the accommodation deck are also larger, to let in more natural light. The fabrics used are also innovative, with a special type of water-resistant Alcantara was used for all the sun beds and the sofas in the cockpit and the sun-deck. The Pershing 108 New Edition has three 2638hp MTU 16V2000 M94L diesel engines running on surface-drives, and should be capable of more than 42 knots.